The proboscis monkey or long-nosed monkey, known as the bekantan in Indonesia, is a reddish-brown arboreal Old World monkey with an unusually large nose. 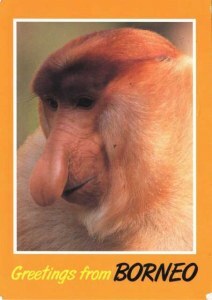 It is endemic to the southeast Asian island of Borneo. This species co-exists with the Bornean orangutan. It belongs in the monotypic genus Nasalis, although the pig-tailed langur has traditionally also been included in this genus. The monkey also goes by the Indonesian name monyet belanda ("Dutch monkey"), or even orang belanda ("Dutchman"), as Indonesians remarked that the Dutch colonisers often had similarly large bellies and noses.